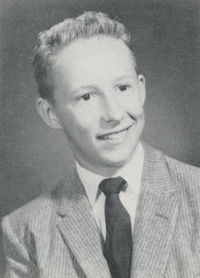 Obituary – Thompson, Robert John « Perry High School Alumni Association, Inc.
﻿Baseball 56-59; Lettermen’s Club 56-59; Band 56-58; Football 58-59; Basketball 56-59; Class Assemblies 57-59; Junior Play 57-58. Robert John Thompson, 64, of Olathe, Kansas passed away Saturday, Jan. 28, 2006, at Olathe Medical Center. Mr. Thompson was born Dec. 11, 1941, in Ponca City, Okla., to John Carey and Alma Irene Thompson. He graduated from Perry High School in 1959, then went on to receive his bachelor of science in education from Oklahoma State University. Despite his alumni status, he remained a staunch Oklahoma Sooners fan all of his life. He was a wonderful husband, father, and grandfather. He spent his life providing loving support and devotion to his family and friends. He will always be known as an extremely energetic and outgoing individual who was loved by many. He leaves an enduring legacy that will be a beacon of light for all of those he touched. Mr. Thompson was a very successful football, basketball and baseball coach in the junior high and high school ranks in Edmond, Okla., in the late 1960’s and early 1970’s. During this time, he also served our country for over twelve years in both the Army Reserve and National Guard. In the mid-1970’s he accepted a position as a sales representative for Fram Corporation. His career took him from Oklahoma to Rhode Island and ultimately to Kansas where he retired in July 2001. Upon retirement, Mr. Thompson again returned to the coaching ranks by instructing his grandchildren in their athletic endeavors. Mr. Thompson is survived by his loving wife Mrs. Peggy Lynn Thompson of Olathe; a son, Mr. Scott Brower Thompson of Olathe; three daughters, Mrs. Kristen Lynn Todd of Olathe; Mrs. Carey Jane Elsbernd of Andover; and Ms. Leigh Elizabeth Thompson and her fiancè Michael Noel McKinley, both of Overland Park; and eight grandchildren: Nicole, Sophie and Nate Thompson; Sam and Jack Todd; and Abbey, Bradley and Joshua Elsbernd. A visitation will be 9 a.m. Wednesday to be followed by the funeral celebration at 10 a.m. at the Calvary Baptist Church at 8130 Lackman Road in Lenexa. Pastor Brian Albert will be conducting the ceremony. Burial will follow in the Olathe Memorial Cemetery at 738 N. Chestnut St. in Olathe. Memorial contributions may be given to the American Heart Association, 6800 W. 93rd St., Overland Park, KS 66212, or the O.U. Foundation, Attn: Sooner Club, 180 Westbrooks, Rm. 3575,Norman OK 73019.